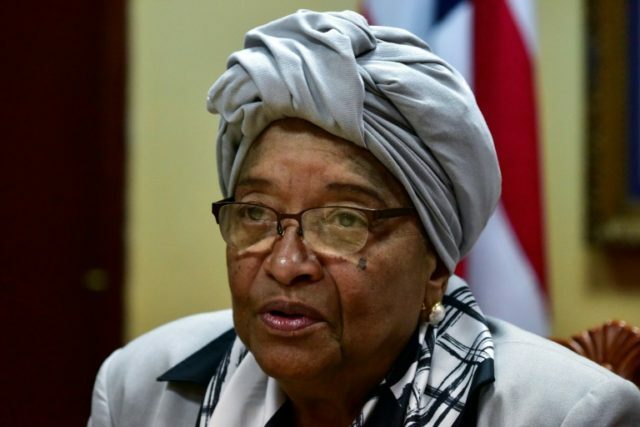 Monrovia (AFP) – Ellen Johnson Sirleaf, who shared the 2011 Nobel Peace Prize as a champion of women’s rights, is stepping down after making history as Africa’s first elected female president in Liberia. Taking the reins of a nation that had just emerged from a civil war leaving an estimated 250,000 dead, Sirleaf will be remembered for maintaining peace and attracting massive donor funding as she rebuilt her country from scratch over 12 years in power. “We were a nation exhausted from three decades of conflict. We were starting from zero, with the complete destruction of our national infrastructure, a collapsed economy, and a state incapable of providing services to its people,” she recalled of her 2006 inauguration in a final speech to the nation on Wednesday. She will on Monday hand power to former international footballer George Weah, representing the West African country’s first democratic transfer of power since 1944, and will leave behind a mixed record of peace and freedom of speech cherished by the population, but stubbornly low living standards. Sirleaf, 79, presided over the 2014-16 Ebola crisis during which more than 4,000 Liberians died, and struggled to counter the effects of plunging commodity prices in a nation highly dependent on exports of iron ore and rubber. She also weathered regional crises in West Africa, most notably as a mediator during The Gambia’s 2016-17 political crisis, when President Yahya Jammeh stubbornly refused to stand down after losing an election. Sirleaf made use of her international cachet as a Harvard-trained economist, former finance minister and an executive at the World Bank to get a massive chunk of Liberia’s debt written off in 2007. Sirleaf also attracted investments in the mining, agriculture and forestry sectors and offshore oil exploration. Her high profile abroad as a symbol of post-war reconstruction has not saved her from messy politics at home, where she has faced criticism over the absence of prosecutions for war criminals, and allegations of nepotism surrounding the employment of her sons. “When Ellen came to power, the expectation of the Liberian people was high, so high that she could not meet up with such expectation,” said political science professor Emmanuel Nimely. Half of the roads around Monrovia have been rebuilt and the capital now has running water. Electricity, once non-existent here, is available in some parts of the city but the supply is still haphazard. Yet unemployment is still high and extreme poverty pervasive. Most Liberian children do not finish school. She herself told journalists last week there were “more things we wanted to do”, adding that her agenda was “more expansive than what we’ve achieved”. Turning around Africa’s oldest independent state — first founded for freed US slaves — where institutions had become rotten to the core, was never going to be easy. Attitudes cooled to Sirleaf at home when a 2009 Truth and Reconciliation Commission named her on a list of people who should not hold public office for 30 years for backing warlord-turned-president Charles Taylor. Sirleaf admitted to initially backing Taylor’s insurgency against Samuel Doe’s government in 1989 which led to the country’s first civil war, but became a fierce opponent as the true extent of his war crimes became apparent. She calmly deflected the myriad criticisms against her, returning time and again to the need to reconcile and move forward. Re-elected in 2011, Sirleaf oversaw a country that slipped into recession under the impact of an Ebola outbreak, virtually shutting down businesses, and the collapse in commodity prices. “The last five years of Ellen’s regime were marked by a flood of people coming from the diaspora to get jobs while locally qualified people” were overlooked, Nimely told AFP. Born Ellen Euphemia Johnson on October 29, 1938, in the capital Monrovia, she wrote in her memoirs that an old man predicted days after her birth that she would grow up to rule. The sprightly grandmother, who is equally at ease in flowing robes and headdresses while charming financial institutions, and in a comfortable pair of jeans and a cap on the streets of Liberia, married at age 17, but later divorced after the relationship turned abusive. She has four sons and 11 grandchildren.